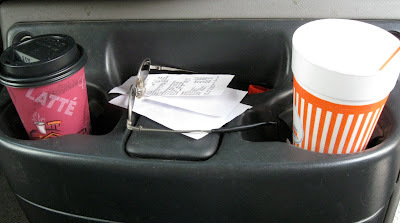 The cupholders in our van reveal a lot about my first year retirement – an increase in time spent with husband Walter at a local coffee shop and a decrease in the number of meals we prepare at home. In 12 days I will begin my second third year of retirement. I wonder what other new behavior patterns will emerge! 4/25/2010 note: Thanks, Jeremy, for correcting my arithmetic! Time does speed by when you are having fun. I think you will be on your third year of retirement. MK was born in 2008. You retired shortly after. So two years are already under the belt. @jeremy - You are right; I will be starting my third year. OK, that means I can chalk up one change - a total break down in my ability to calculate simple numbers!! My math skills were a little sloppy to begin with, now that I'm (also) on my third year of retirement, I'm hopeless. To think I used to be an accountant! @Syd - Having company in this mathematical state is welcomed!